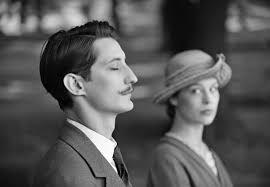 Selected to compete for the Golden Lion at the 73rd Venice International Film Festival and winner of the Marcello Mastroianni Award at Venice, Frantz, written and directed by Francois Ozon , tells the story of Anna, a German woman mourning her fiance's death in World War I who is slowly drawn to the French soldier, Adrien, who shes encounters visiting her fiance's grave. All is not what it seems however, as this tale takes multiple thematic and tonal twists and with conflicting emotions on all sides depicting the damage and destruction of the first World War and the "lost generation"that were left behind. Francois Ozon drew his inspiration from Ernst Lubitsch's 1932 drama Broken Lullaby, and along with stunning visual references to painter Caspar David Friedrich, portrays magnificently a harrowing social period in World politics. Interwoven with various styles,with the film at times resembling a Hitchcockian suspense thriller and on other occasions a heartfelt and beautiful love story, Ozon keeps the viewer constantly engaged with more traditional themes such as the devastating effect of the World War interlaced with contemporary themes such as love, loss and self discovery in an emotional kaleidoscope of cinema magnificence. Aided in no small part by Pascal Marti's, Cesar Award winning cinematography, this film simply looks superb with a classic bygone period of cinema reconstructed for the modern viewer. The talented cast also deserve lavish praise as their performances give an resonance to an already impressive production. Pierre Niney, is superb as conflicted and guilt ridden Adrien but it is 21 year old Paul Beer in a breakthrough performance that steals the show as grief stricken Anna. Overall, Frantz is a multi-faceted compelling and beautiful piece of Art House cinema that should championed in modern times. Highly recommended.